William Lilly's War Charts, by David Plant: 2 - If his MAJESTY should procure Forces out of Ireland to harm the Parliament? If the QUEEN, then in the North, would advance with her Army? When She and his Majesty should meet? Chronologically, this is the second of the 'war charts' in Christian Astrology. No details of the date or time are given in the text, but computer-generated ephemerides show the question was asked at around 6.00 p.m. GMT on 18th March 1643 (OS). It was the hour of Venus on a Saturday evening in the Roundhead stronghold of London. 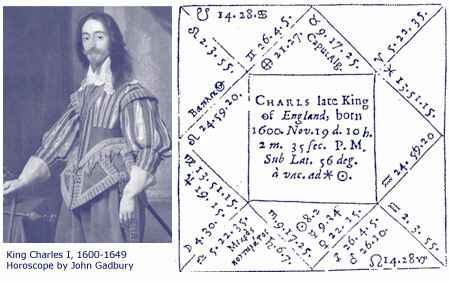 The 'Prince Rupert' horary discussed in the previous article was a relatively straightforward contest chart. The prospects for the opposing commanders were judged by the strength of their principal significators. This multiple question is more complicated. The querent is asking Lilly to delineate enemy troop movements and strategy from a horary chart. The wording of the first part of the question confirms that the Irish 'troubles' go back a long way in history. In 1641, Irish Catholics rose up in rebellion against Protestant settlers from England and Scotland who had forcibly colonised Ireland. When English and Scottish troops were sent to suppress the rebellion, the Irish Catholics organised themselves into a Confederacy to oppose them. While the Irish War was still in progress, the Civil War erupted in England. By March 1643, King Charles urgently needed more troops. He decided to negotiate a truce with the Irish Confederates so that English regiments stationed in Ireland could be recalled as reinforcements against the Roundheads - which was a worrying development for Parliament. The question specifically mentions the King, so Lilly begins his judgement by looking to the 10th house, the house of royalty. With Cancer on the Midheaven, King Charles is shown by the Moon which is very strong: in its own sign, angular and waxing. Its only impediment is slowness of motion. The 2nd house from the 10th represents the King's resources, which Lilly uses here to signify the Royalist cause in general. This house (the 11th) is ruled by the Sun which is also very strong: exalted, angular and within orb of a trine to the 11th cusp. From the great strength of the luminaries, Lilly judged that the King would indeed 'procure forces out of Ireland' - both commanders (Sun) and ordinary troopers (Moon). The danger to Parliament is shown by the opposition of the Sun to the Ascendant, which represents the cause that the querent supports. The Royalist threat is weakened, however, by the proximity of the Sun to the South Node, and its square to the Midheaven. These afflictions suggest confusion to the Royalists and disruption of the King's designs. Furthermore, neither of the luminaries are in fixed signs: the King may get his troops, but any possible military advantage is likely to be lost. The King's negotiations with the Irish Confederates began a month later on 23rd April 1643. The threat of enemy reinforcements would not have been common knowledge when the question was asked; the querent was very well-informed. It was during the previous month, February 1643, that Lilly first met his influential patron, Bulstrode Whitlock MP, to whom Christian Astrology is dedicated and who later rose to high office in Cromwell's Protectorate. Whitlock may or may not have been the querent; it must certainly have been someone equally deep in the counsels of Parliament. Terms for the Irish truce were concluded in September 1643, and troops began arriving back in England in November. Many mutinied when they realised that they were expected to fight against Parliament. Small contingents reinforced various Royalist armies around the country. The majority of them went to the army of Lord Byron, an ancestor of the great romantic poet and a fierce Cavalier. Byron besieged Nantwich, the last Roundhead stronghold in Cheshire, but Parliament's General Fairfax marched an army across northern England in midwinter to confront him. Despite his troops from Ireland, Byron was defeated in January 1644. As Lilly predicted, the military advantage gained by the King proved to be negligible. Meanwhile, the MPs of Westminster were using the situation to inflict political damage on the Royalist cause. Playing upon the worst fears of all good Protestants, Parliamentary directives and pamphlets consistently referred to the recalled troops as ferocious Irish Papists recruited by the King, who was then portrayed as a traitor to the Protestant religion. As Lilly says (and Parliament calculated), the King's reinforcements from Ireland 'much hardened the hearts of the English against him'. 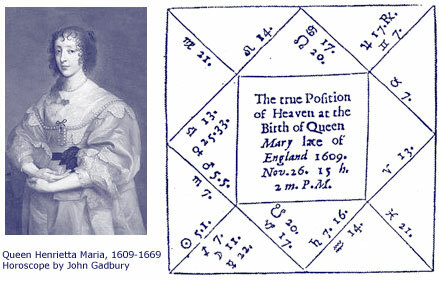 If Lilly's querent of March 1643 really was a leading Parliamentarian, as suggested above, then this horary could conceivably have planted the idea of a propaganda campaign in his mind. The Sun square the Midheaven and afflicted by the South Node, together with Mercury retrograde in the 7th house of Parliament's enemies, is an apt astrological description of the King's cause undermined by lies and slander. Did the querent consciously adopt this symbolism and start looking for ways to discredit him? The rest of the judgement concerns Queen Henrietta Maria. King Charles's marriage to her in 1625 had caused consternation in England because she was a devout Roman Catholic. The Puritans blamed her for the drift of the Anglican Church towards practices which reminded them of Catholic idolatry and superstition. Criticism of the Queen in the House of Commons precipitated the final rift between King and Parliament in 1642. When war looked inevitable she went to Holland, taking the Crown Jewels with her. These were pawned in order to buy weapons and ammunition for the Royalist cause and to recruit English mercenaries fighting in the Continental wars. She returned to England in February 1643, landing at Bridlington in Yorkshire. By the time the question was asked she had moved to York, the principal Royalist stronghold in the north of England. The querent was concerned that she would move south to join forces with the King's army at Oxford. The Queen is signified by Saturn, ruler of the 7th house from the 10th. The Moon, significator of the King in this chart, is applying to trine Saturn, a positive indication that they will be reunited. As the King's significator is applying, Lilly thought he must be very eager to see her. This was true on two levels. Unlike his homosexual father, James I, or his promiscuous son, Charles II, the King was devoted to his wife and family, and it was over a year since he had seen Henrietta Maria. On a practical level, she headed an army 2,500 strong and a convoy of 150 wagons packed with weapons and ammunition. Lilly did not expect an immediate meeting. Saturn, the Queen's significator, is the most ponderous of the planets while the one impediment of the Moon in this chart is that it is slow in motion. Furthermore, Saturn is about to move into Aries, its sign of fall. With Jupiter, the great benefic, moving away from the Queen's significator and Mars moving towards a hostile square, her progress south looks problematic. Lilly used two methods of timing in this judgement. He timed the meeting of the King and Queen symbolically, by the number of degrees that separate the exact trine of their significators, but handled the approaching square of Mars and Saturn differently. Lilly interpreted the square as an indication of hostile military action against the Queen's army. He timed it astronomically - 'she would be crossed at or near the time of that aspect'. The perfection of the aspect occurred in mid-April 1643. Lilly mentions a military incident near Nottingham on 11th April, when the Queen apparently 'lost some forces' and would have lost more but for 'some knaves or fools in our Armies'. I am unable to find any reference to this incident in military histories and can only assume that Lilly believed a false report. The 'knaves and fools' may be a side-swipe at the Parliamentarian commanders in the Midlands, who were quarrelling with one another at this time. However, Lilly's judgement can be vindicated by the history books. The Queen was obliged to stay in York because the military situation in the Midlands, between York and Oxford, was volatile in the spring of 1643. Both sides had armies in the field; cities and towns were changing hands with bewildering speed. The King ordered Prince Rupert to prepare the way for the Queen's advance by reducing Roundhead strongholds in the Midlands. Birmingham went up in flames on 3rd April, then Rupert besieged Lichfield, whose Cathedral became a temporary fortress. The Mars-Saturn square perfected on 12th April and the following day the Earl of Essex marched his army out of Windsor Castle to attack the Royalists at Reading. This was widely believed to be a preliminary move to a Roundhead assault on the King's headquarters at Oxford. Prince Rupert's army in the Midlands was recalled to counter this new threat, so the Queen's advance from the north was thwarted. She stayed at York until June. By then, Royalist victories around the country made it relatively safe for her to move south. On 13th July, she was reunited with the King, who had chosen the site of the battlefield of Edgehill in Warwickshire as a suitably dramatic rendezvous. They made a triumphal entry into Oxford the following day. The Moon is a little under 4 degrees from the trine of Saturn in Lilly's horary of 18th March; the King and Queen were reunited a little under 4 months after the question was asked. David Plant studied the methods of 17th century astrology under Olivia Barclay and was assistant editor of the Traditional Astrologer Magazine between 1993 and 1999. He now runs the British Civil Wars, Commonwealth and Protectorate website, a widely-acclaimed resource for students of the Cromwellian era. © David Plant. This article first appeared in the Traditional Astrologer Magazine, Issue 2, Autumn 1993; pp.17-19. Published online: April, 2008.